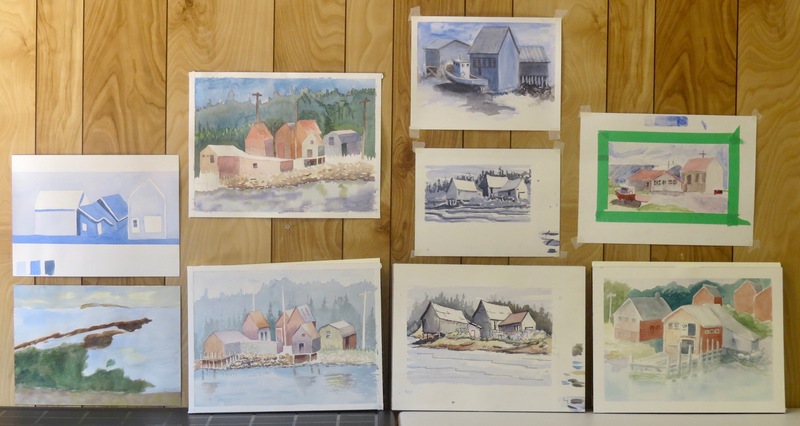 Grand Manan Island 2018 – Final Two Days! We kicked off Thursday morning at our studio. 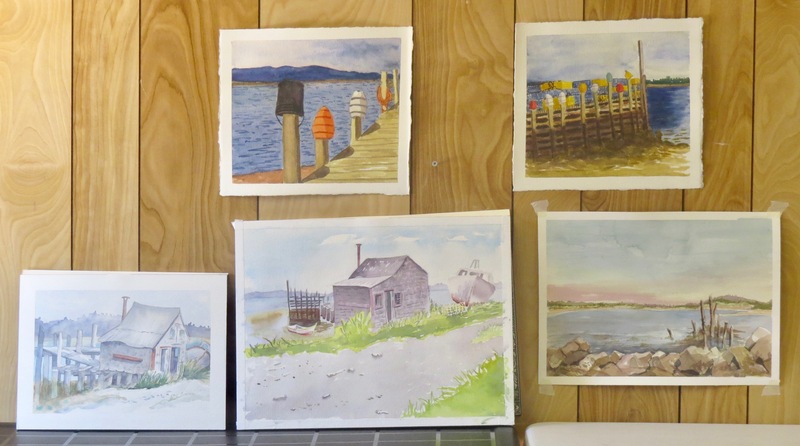 My demonstration was of graded washes; washes over large areas, even the whole sheet, with gentle soft-edge transitions. First of all, I did two washes of skies. Then, I did an unusual one; an almost abstract runny wash that suggested a misty landscape. As it dried, however, I worked light to dark and gradually developed an interior with a window. When finished, the misty landscape could be seen through the window. The final wash suggested a foggy day. I used value to accentuate the feeling of depth and atmosphere. Following our session at the studio, we convoyed to Dark Harbour on the west side of the island. Dark Harbour is home to the largest fleet of dories on the island and they’re used primarily for gathering dulse, an edible seaweed. The dories are always a popular subject and we spent a productive day below the towering cliffs. Camps, cabins of all shape and size, line the beach at Dark Harbour. This one still seems to be celebrating last month’s Canada Day holiday. The tide was flowing in quickly toward the end of the afternoon. We took the hint and made our way back for critique. Don’t forget to click on a critique image to see a larger version. Would we enjoy yet another day of beautiful weather? 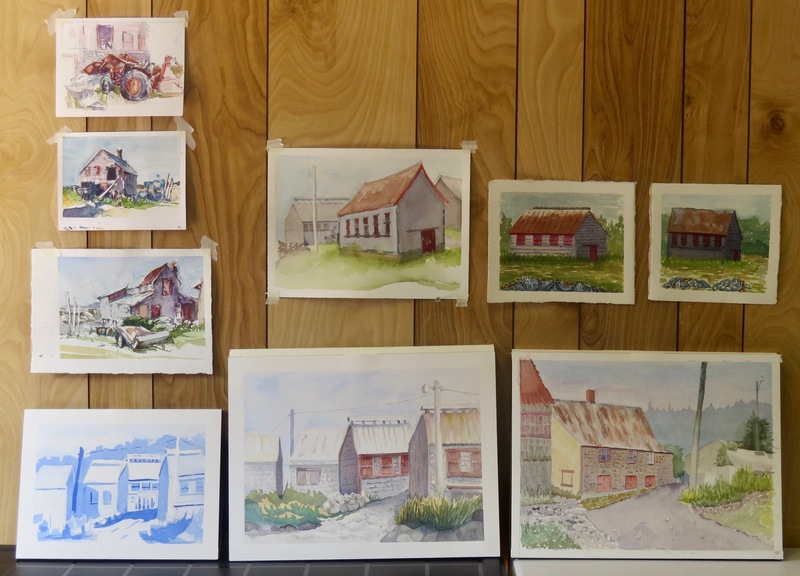 Our painting site was a quiet laneway of sheds and boats at Ingall’s Head. I set up my easel for one more demonstration. 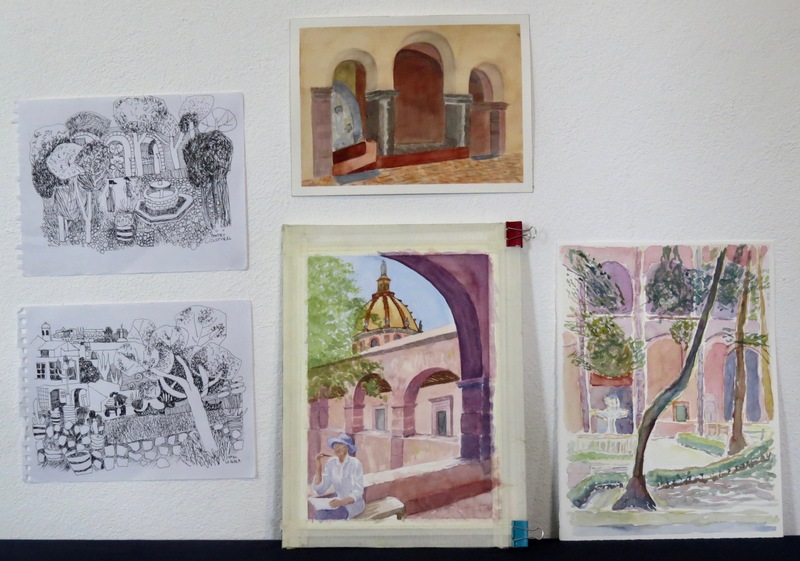 I wanted to take the group through the whole process of a small watercolour painting, starting with a pencil drawing and working light to dark and big to small. At one point, I moved everything to a shadier spot and completed the work there. We got sun, all right! 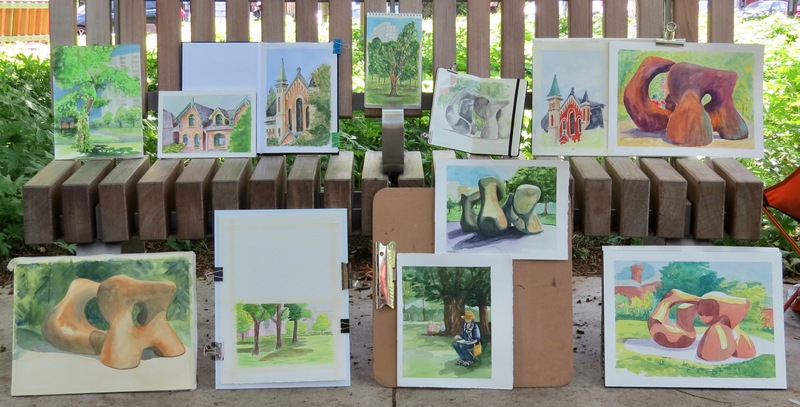 Our painters dispersed after the demo to look for shade and subject matter. Alas, all good things come to an end. We went back to our studio to cool off and have a look at the day’s work. On Friday evening, we gathered at our cottage for our Farewell Dinner. It was an opportunity to relax, socialize and discuss the week. After dinner, we had one more group event on our itinerary; Final Critique. 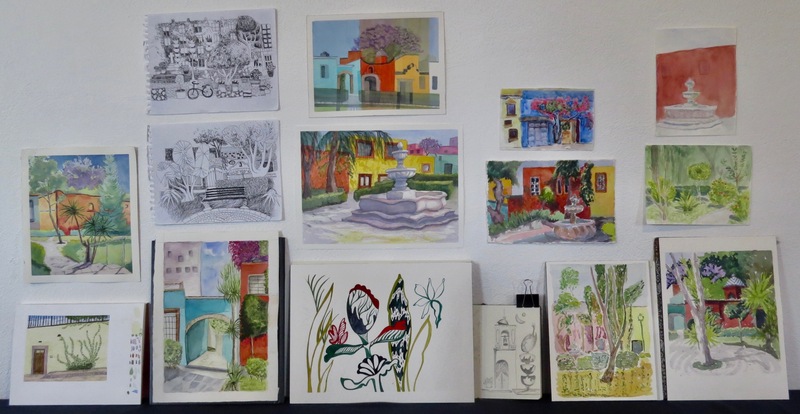 Each artist showed us a small selection of their week’s creative output and talked about it for a few minutes. It’s a very nice way to summarize our time together. Earlier in the day, our good friend and excellent photographer, David Ogilvie, took a group photo. Here they are; the Grand Manan class of 2018! Thanks go to all of the participants for their hard work and enthusiasm. Also, special thanks to my partner, Aleda O’Connor, for taking time from her own painting to assist me in every way. In addition to that, I appreciate you for following, liking and commenting. 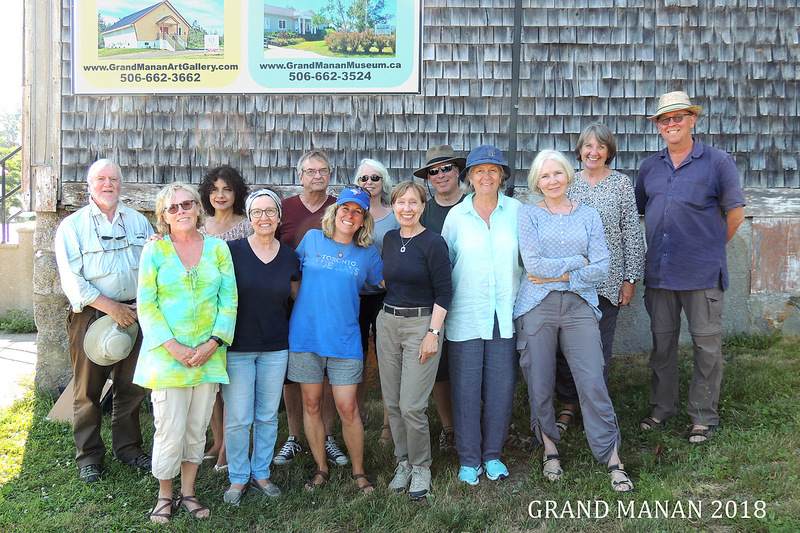 Grand Manan Island 2018 – First Three Days! 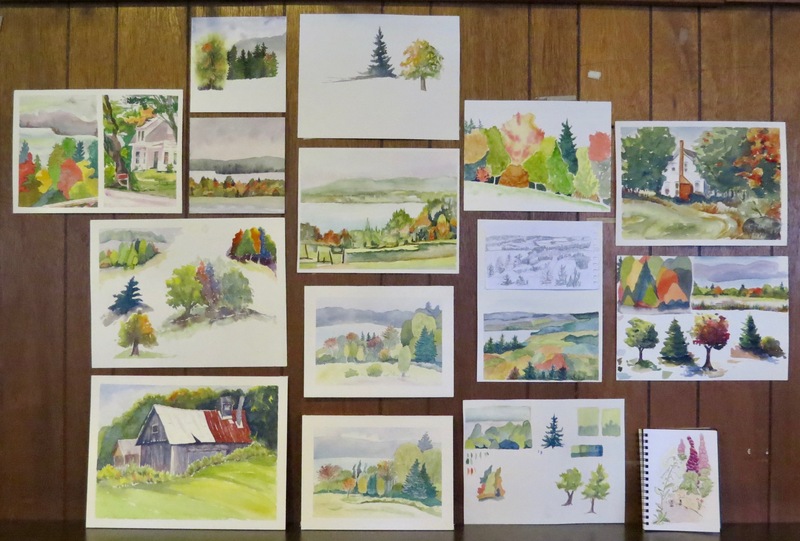 Last Sunday, the 2018 workshop participants arrived on this beautiful island in the Bay of Fundy, New Brunswick, Canada. Everyone settled in to their lodgings and, in the early evening, gathered at the Compass Rose Inn for our Welcome Dinner. It was a delicious lobster feast. On Monday morning, we met at 9am sharp at our studio, the North Head Market Hall. We discussed the week ahead. Some of the more experienced painters headed out to the nearby harbour and got to work. I kept the newer participants behind and taught my ‘drawing checklist’ which hinges on the use of a measuring stick to help with angles (perspective) and proportion. At one point, we stepped outside to analyze the angles of a neighbouring building. Following our session at the studio, the rest of the group wandered over to the harbour and settled in to sketch and paint for the day. As we painted, the everyday activities of the island went on around us, such as harvesting rockweed. It was a great start to our week. At the end of the day, we went back to our studio for our critique. Click on any critique image to see a larger version. 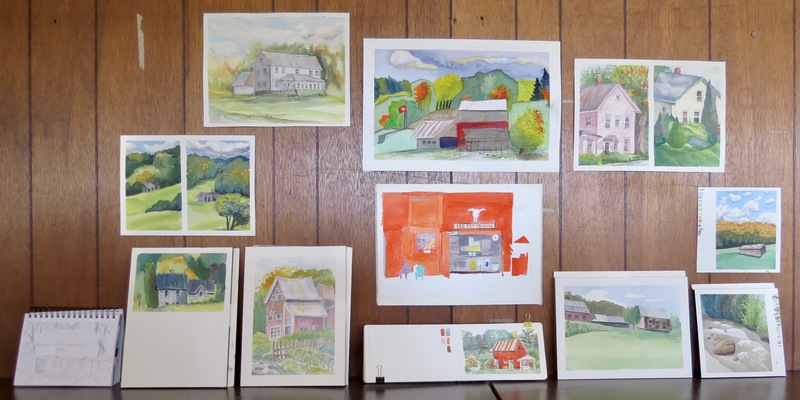 After critique, I presented a slide show (PowerPoint) with the theme of planning a watercolour. 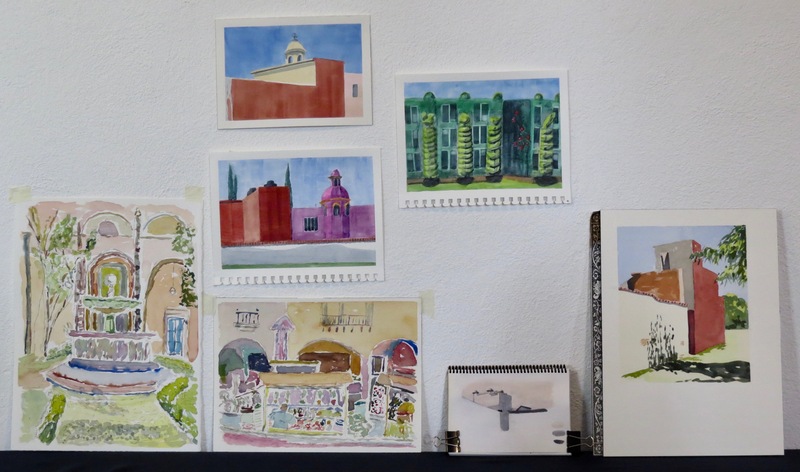 It included ideas and artwork of quite a range of artists from the contemporary American Frank Webb to renowned English watercolour painters from as far back as a few hundred years ago. It set the table for the Tuesday morning demonstration. 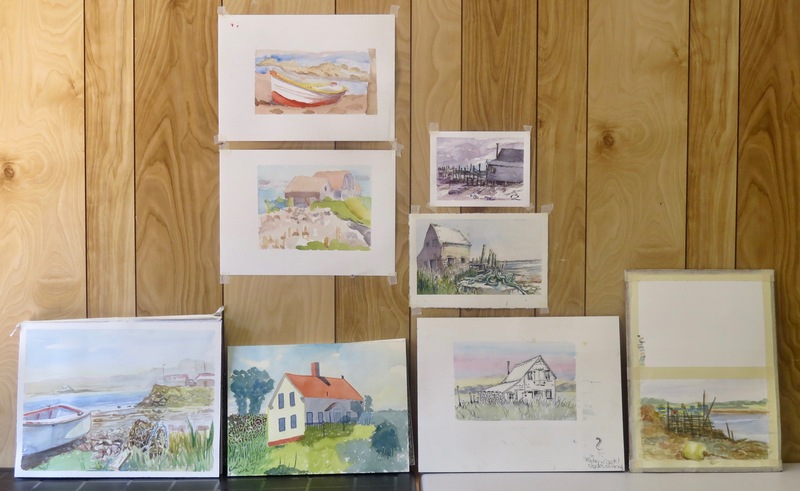 Woodward’s Cove was our sketching and painting venue for Tuesday. 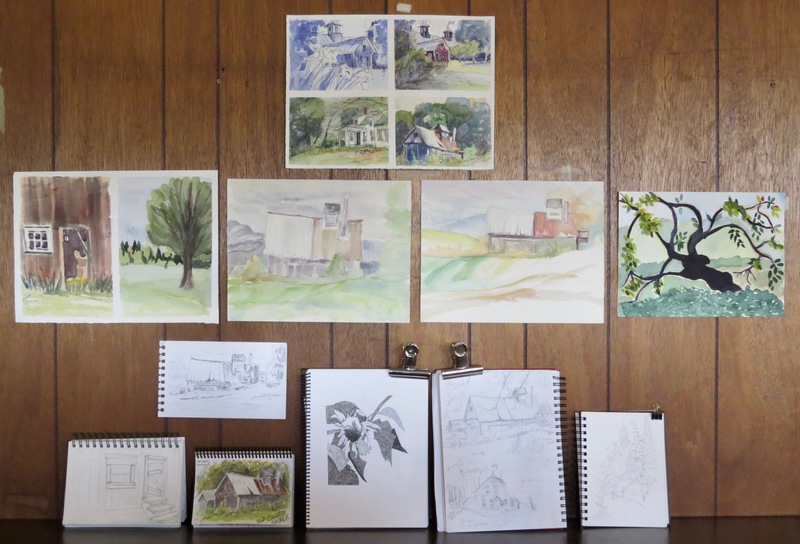 I followed up on ideas we’d discussed during the Monday slide presentation and demonstrated on-site at my easel. I painted a study in four values; paper-white, light middle value, dark middle value and dark. Let me show you the steps. I started with a pencil drawing. Next, I painted a light middle value everywhere except for the areas I wanted to preserve as my most important lights. A dark middle value starts to show more structure overall. The final value is the darkest of all. The darks add definition and detail. The harbour at Woodward’s Cove drains completely at low tide and fills up again six hours later. 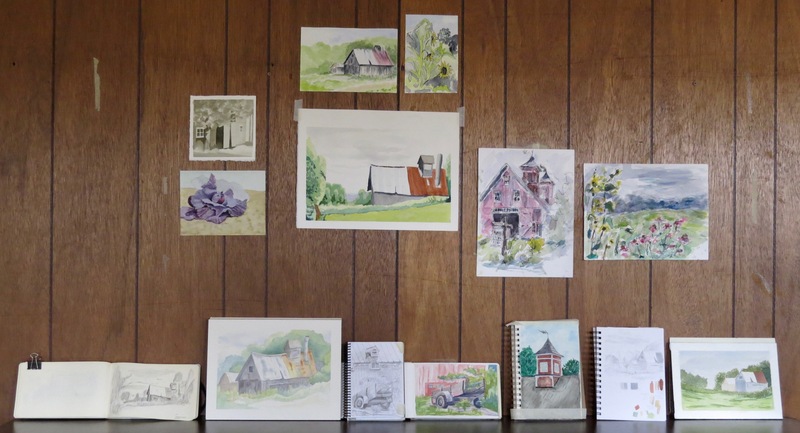 It’s a great painting site with a wide range of subject matter. Another day of sunshine! 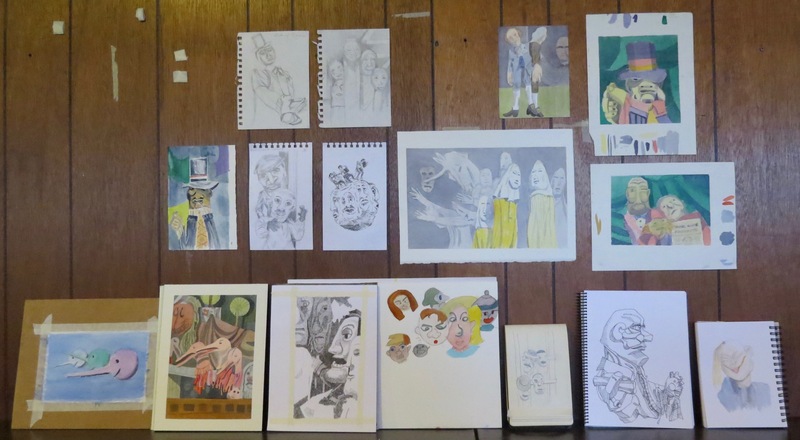 Eventually, we gathered at our studio for critique. This workshop, as stated on my website, is for participants with some previous experience in the medium. 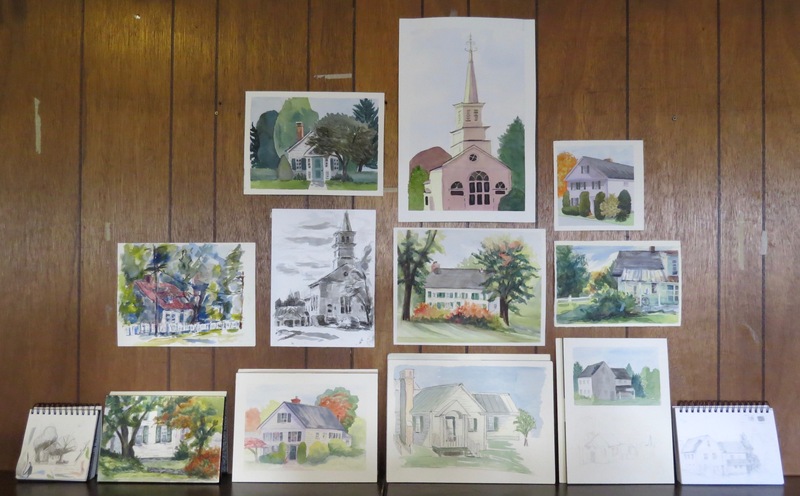 No-one in our group was a complete beginner but several had taken other watercolour courses and not really been taught any fundamentals. Go figure! 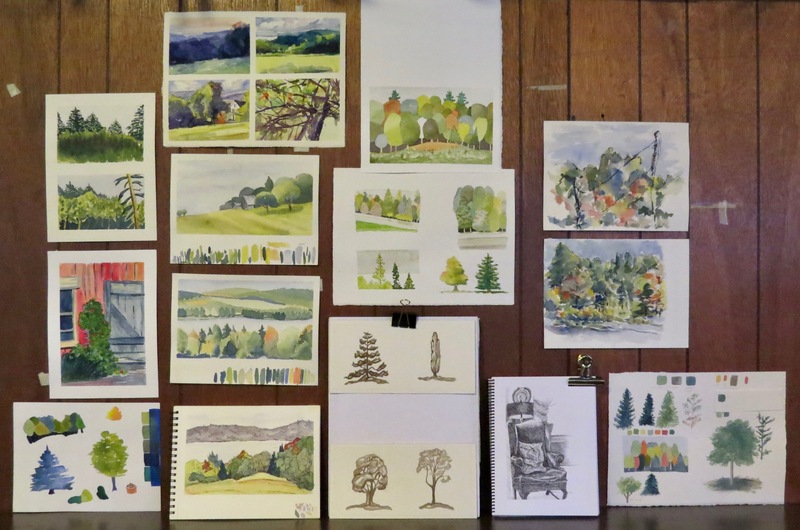 So, on Wednesday morning, I gave a short refresher of basic techniques and brush-handling in the studio. Once the demonstration was done, we joined the rest of the gang at historic Seal Cove. A bit of fog rolled in and added some mystery to the old herring smokesheds and docks that make this such a special painting spot. Lovely, isn’t it? Let’s see what the painters did at Seal Cove. We have two more days to go on spectacular Grand Manan Island! Thanks for following and stay tuned.